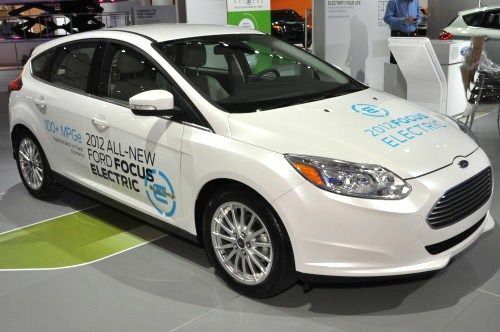 According to multiple sources, Ford Motor Company has begun shipping the initial wave of for-sale examples of the 2012 Ford Focus Electric to select dealerships in a very small launch market. According to Automotive News, Ford Motor Company has started shipping the first of what will be an initial batch of 350 2012 Ford Focus Electric hatchbacks to California, New Jersey and New York as part of the first phase of the product launch. This first group of electric Focus models will reach 67 dealerships in those markets with getting six cars – five to sell to customers and one to keep on hand as a dealer demonstration vehicle. Ford has decline to comment on this information at this time, stating only that they plan to ship the Focus Electric to dealerships starting “this spring”. Ford had modest expectations for the Ford Focus Electric as it may take more time (and higher gasoline prices) to convince some American consumers of the benefits of an electric vehicle compared to the high purchase price. The Focus Electric, for example, carries a starting price of $39,200 but as is the case with other electric vehicles and hybrids – there are a variety of state and federal tax credit that can cut that price back by at least $7,500 depending on where you live. The other side of the coin in the battle against vehicles like the Ford Focus Electric is the concern over range but with a 100 mile range and a charging time of just 4 hours with a 240 volt charging station (half the charging time of the Nissan Leaf), the Focus Electric could put some buyers’ minds at ease. Even with tax credits and other discounts surrounding the initial start-up price of the Focus Electric, Ford is only hoping to sell around 5,000 examples of their 5-door EV in the first year. This is due to not just the high price of the Focus Electric but the mere fact that this is an “affordable compact car” with a price tag nearing $40k. The gasoline powered 2012 Focus 5-door carries a starting price of just $18,300 in SE trim and a fully loaded up Focus Titanium with literally every single option and accessory listed is just $28,934. This means that the Focus Electric, while packing many of the comforts that you find in the Titanium trimline for the traditionally powered Focus 5-door, costs over $10,000 more just for the electric drivetrain. Sure, lots more goes into the Focus Electric than just the drivetrain but at the end of the day – the average buyer will think that he or she can buy a great many gallons of gas for the difference in price between the two and still come out on top. This is what the Focus Electric will have to overcome in order to compete with the likes of the Chevy Volt and the Nissan Leaf but with the projected output and advantages of the Focus Electric, it could very well cut into the sales of other pure-electric models like the Leaf. The Ford Focus Electric is built right alongside the rest of the new Focus models at the Michigan Assembly Plant in Wayne Michigan with the lithium ion batteries being provided by Compact Power Inc of Troy Michigan.